Browse our collection of 1 High T-Shirts and more. Designed and printed in the USA. 100% Satisfaction Guaranteed. About this Design Party like a country girl by the bonfire while you're tailgatin' and drinking beers after driving you trucks down old country roads in this design that says "High On Your Loving's Got Me Buzzin' Like A Streetlight". 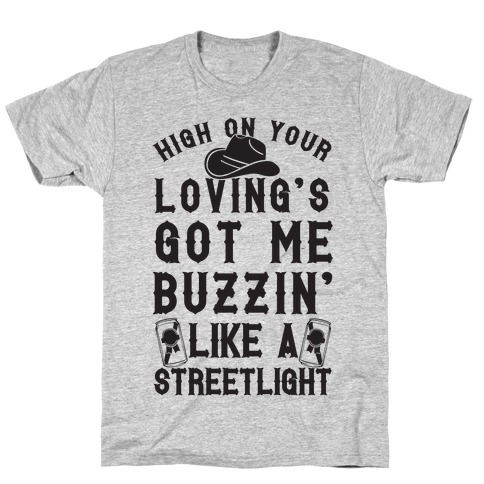 Party like a country girl by the bonfire while you're tailgatin' and drinking beers after driving you trucks down old country roads in this design that says "High On Your Loving's Got Me Buzzin' Like A Streetlight".